company from China to construct uganda Kasese railway line - Uganda Safari News. company from China to construct uganda Kasese railway line – Uganda Safari News. 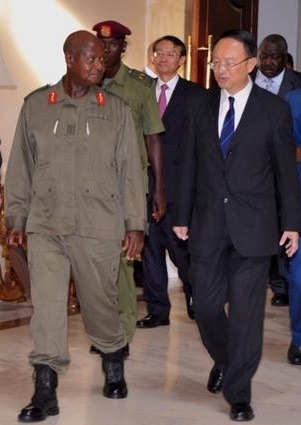 Home>>Posts>>company from China to construct uganda Kasese railway line – Uganda Safari News. he PTresident’s signing of the deal for the construction of the southern corridor Kasese airway line is good news to the tourism industry because this has come at the perfect time when Uganda the pearl of Africa is witnessing an increase of safaris to Uganda by the different travelers both local and international especially seeking to spend their holidays in south western Uganda were most of the tourists attractions such as the mountain gorillas in Bwindi , Rwenzori mountain, Queen Elizabeth national park among others are located. The call for CHEC Chinese Company to construct the Kasese railway line, I think is good news for the tour and travel industry in Uganda because if the kasese air way is constructed, it will help to solve the problem of inaccessibility currently affecting the many travelers taking Uganda safaris to south western part of Uganda. The introduction of the kasese air way will also help to reduce the nine to ten hectic hours’ drive under taken by visitors on their gorilla trekking safaris to Uganda’s Bwindi because when this air way is finally constructed, visitors can easily fly in less than one and half hours to kasese air trip or kisoro and hence enjoy their wonderful tourism activities when they are not tired as it’s the case when one uses the poor road transport. Addition, President Museveni’s request for the Chinese Government to set up artificial sea-level waterway connecting the two water bodies in Uganda like it’s the case with the Suez Canal in Egypt, is really promising plan to country Uganda because the country has the potential to handle it, because Uganda is being surrounded by the different world wide remarkable water bodies such as the stunning lake victoria, magnificent River Nile ,Lake Albert, L. Edward among others . In terms of the tourism sector, this is beyond even the long awaited opportunity where tourists on their Uganda safaris can easily explore the water body wonders of the pearl of Africa Uganda. Besides exploring, when this is implemented, it will increase safaris to Uganda because travelers can easily connect at a cheaper cost from other neighboring countries like Kenya, Tanzanian among other to Uganda and above all, it will help to diversify tourism product in the country because when such canals are built, they can be packaged and marketed as tourism product and at the end also attract more adventurous tourist to take safaris to Uganda. In nut shell, presidents’ current visit to china has a lot of promising beneficial plans for the country and in particular to the tourism industry because if the government can borrow the brilliant ideals such as constructing something similar to the seuzi canal in Egypt, setting up more air ways, and constructing speed passenger train service like that owned by the Chinese Railway Corporation, all these can help to develop the tourism sector Uganda and even attract more safaris and Tours to Uganda.